Before The Flash goes on hiatus, they’re sending us off with a nice little Iris-centric episode. Or... they’re sending us off with an episode that wants to be Iris-centric but, like almost the entirety of the “Iris is going to die” Savitar plot, the show fails at making it all about Iris. Granted, the problem is a lot less glaring in a single episode than it was throughout a half-season story arc, and they do at least try to give Iris a more active role in her own narrative. But if only it were a continuation of some long-running Iris character thread, rather than a one-off episode that works to brush all the rising questions about Iris’s life (Is she still working as a journalist? Does she still write? How much time does she devote to leading Team Flash now that Barry’s back?) under the rug. We’re not going to stop asking those questions, you know, The Flash writers. You don’t get to half-answer them once or twice a season and then expect us to ignore the fact that the leading lady of your show barely exists as a legitimate character outside of her role as Barry Allen’s girlfriend-turned-wife. Iris deserves better, Candice Patton deserves better, and the audience deserves better. 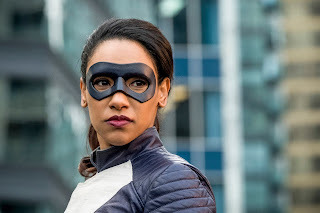 The first twenty minutes of the episode focus on a few things: Ralph Dibny whining and being an awful coward, Harry deciding to build himself a thinking cap (against Cisco’s advice), and a bank robbery in which the metahuman robber gets his powers snatched before being able to make a getaway. Summarizing it all like that, I’m a tad surprised that it took up twenty whole minutes. Anyway, Iris’s power transfer comes in when she, having been shamed by Ralph into feeling guilty for leading the group from the safety of S.T.A.R. Labs, goes with her father to follow up with one of the bank robbery witnesses, an EMT named Matthew Kim. Kim freaks out, holds a scalpel to Iris’s throat, and when Barry swoops in for the rescue, he ends up accidentally sending his powers over to Iris. Iris’s new abilities mean testing, because these nerds sure do like to test their metahuman powers. Iris is thrilled, at least as far as the fun running part goes. Barry and the others are more nervous, since they don’t quite understand how this happens or if it can be reversed. Credit to the show: At no point do I get the impression that Barry is jealous of Iris or resentful of not being “special” anymore when his powers go to her. He even seems a little amused by her enthusiasm. A lot of his discomfort with the situation comes from the fact that they have threats like DeVoe (Sir Not Appearing in This Episode) and the person who got the swapped fire powers from the bank robbery hanging over them while their team’s speedster is suddenly an untrained Iris West-Allen instead of Barry, the seasoned pro. There’s a scene in which Barry contemplates the idea of never getting his powers back, but it’s more an extended reaction to DeVoe’s control over Barry’s life than jealousy over Iris. Testing and training gets interrupted by an actual emergency: a fire in a high-rise building with people trapped on the top floors. Barry is cautious about sending Iris in after only having her powers for a little while, but trusts her judgment when she says she wants to go. She switches clothes with Caitlin to be less obvious, borrows a mask left behind by Jesse, and runs off to save the day. Unfortunately, saving the day is a lot easier said than done. She saves the people trapped, but Iris is overwhelmed by the fire, which she doesn’t have the knack for putting out with speedy arm whirlwinds, and the ceiling collapses on her. Barry tells her to phase through the debris, but he’s a crappy teacher so he can’t explain how to do that, and she has to be rescued by Cisco. After the events of the fire, Barry tells Iris it would be okay if she took a breather and let Cisco and Caitlin handle the current meta situation, but Iris is using these new powers to work through some stuff. We learn she’d quit her job as a reporter to lead the team full time while Barry was in the Speed Force and her fearless instincts have been dwindling for a year. She’d grown accustomed to the relative safety of her role behind the console, but that safety makes her feel guilty because people she cares about are putting their lives on the line. More than anything, though, she wants to use her new powers to prove to herself that she can still be fearless. And, okay — that’s all very nice. I appreciate that we get something out of this for Iris. But it’s such a small something, and it’s something that has had zero build-up or foreshadowing all season. Shoving this arc into a single episode tells me that the writers didn’t really care about advancing Iris’s story. It implies that they just had a bullet point on their list of “cool stuff” and decided to build a filler episode around it. 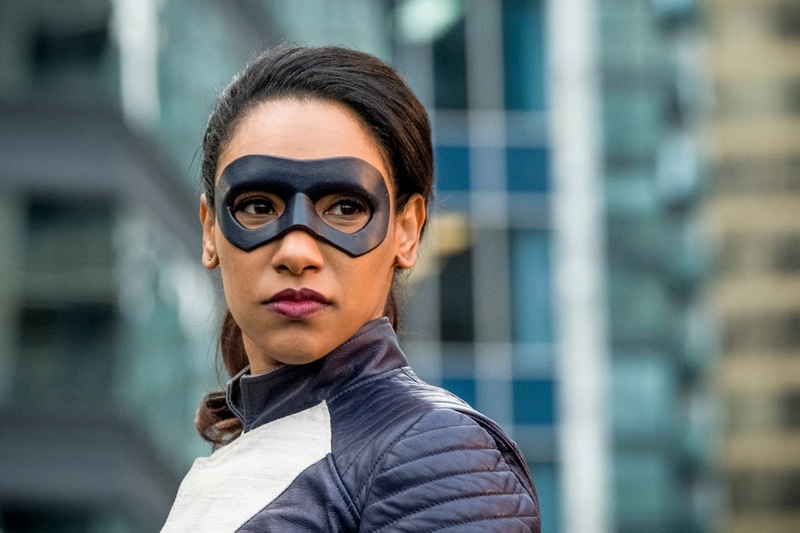 “Iris becomes a speedster” has, to them, as much emotional weight and significance as throwaway gags like “Cisco builds Barry a technologically advanced superhero suit” or “Harry seeks guidance from his alt-Earth selves,” and I doubt the writers sat down and talked about how they could build up Iris’s eagerness to get into the field over the course of a few episodes leading up to this one, or her struggling with her identity as a reporter/writer for weeks before getting this opportunity, or her questioning her validity as leader of Team Flash before stumbling into the role as the Flash. No, I think they sat down and talked about what color her Speed Force lightning was going to be, and that’s it. Not knocking Iris’s cool purple Speed Force lightning; I just wish that there had been a bit more emphasis on Iris, rather than the iris-colored sparkly effects. Another fire-related emergency arises, but this time the culprit is still on the scene. He’s a dude in a studded leather-and-denim jacket yelling about getting some money (or, as he pronounces, “MUNNAY!”). Matthew Kim shows up as well, hoping to talk the guy down from using his powers for evil. Mr. MUNNAY! informs Kim that it’s his fault he got powers in the first place, then Iris swoops in to temporarily arrest Kim while she deals with the fire-starting KISS fan. In the end, Iris douses out Mr. MUNNAY!’s flames with a tidal wave, they recruit Kim onto the team (we’re ignoring that one time he held a scalpel to Iris’s throat, I guess) and he switches the speedster powers back to Barry. The status quo has returned. Also returned: Iris’s writing. She restarts her blog about sightings of the Flash, and tells Barry that, while his destiny and way of helping others is being a good speedster, hers is being a reporter. I’m curious about how Matthew Kim managed to learn he could take powers away in the first place. That’s not exactly a flashy ability, so... did he have metahuman friends? Shake hands with a dude covered in lightning? Barry’s flinch away from Iris speeding off (“Wow, that’s super annoying”) made me realize how much poise Iris has whenever Barry does the same thing. She’s a champ. Caitlin has an adorable proud smile every time Iris volunteers for a mission and it’s wonderful. Iris’s blog is so hideous. Sweet merciful heavens, Iris, hire a graphic designer.